Man, I haven't baked or cooked anything in FOREVER it seems. I had the urge. I needed to, I wanted to, dang it I HAD TO! 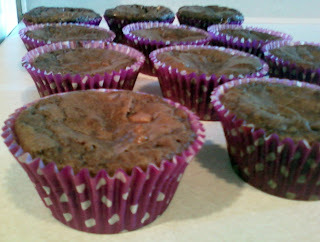 Nobody could stop me, not even the fact that I had NO vanilla, no whisks, no mixing bowls, NADDA! Just a saucepan and a wooden spoon baby. I'm brave, so I starred my oven right in the face and told her what was up! Yes, my oven is a lady. Don't you worry about that! I'm just stoked that I was finally able to turn on my oven in my new house! My oven? YES! Wooo Hoo! I also didn't have a square baking dish to make these, so I just turned them into cupcakes. Hence the name. I was super nervous leaving out the vanilla, I truly love what it does to many baked goods. I love the flavor to pieces, and if I could I would add it to everything. I'm sure you've noticed! After letting the cuppies cool, I dug in and let me tell you.. The vanilla wasn't missing in this at all. Definitely a good choice to bake today! We also don't have internet yet, so I walked up to Starbucks, got myself a tasty little mama aka Passion Tea Lemonade, and am enjoying life. Preheat oven to 350 degrees. Spray a 12 cup muffin pan with cooking spray or line with liners. Set aside. In your handy dandy saucepan, combine the eggs and sugar. With your spoon mix well, until no longer streaky. Add in the melted butter, the flour, the ground chocolate, baking powder, and salt. Mix Mix Mix! 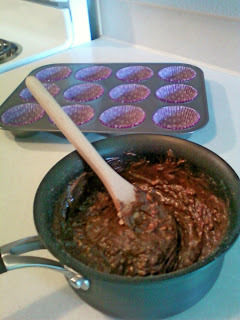 Once ingredients are fully combined,mix in the toffee, then spoon batter into muffin pan. Bake 25-30 minutes or until toothpick inserted in center comes out clean. Now, bask in all your makeshift glory. Much Thanks to Ghirardelli for making a rad recipe that I didn't have to whisk or cream something together.. You rule! For the original recipe, I'm sure you can visit their website, I found mind on the side of my ground chocolate can. Wow! You honestly are a baking wizard!! The things you can do are so incredible. Yum yum yum... once again!